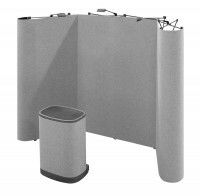 Pop up displays are the most popular style of trade show displays for making large image walls and back wall graphics. 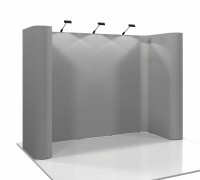 They consist of a collapsible scissor truss that expands or pops up into a full size framework that supports the graphic or fabric panels. 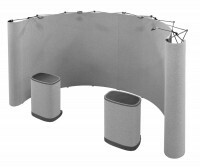 They are lightweight and easy to setup, taking a single person less than 15 minutes to assemble, but they create a solid impression for your graphics. 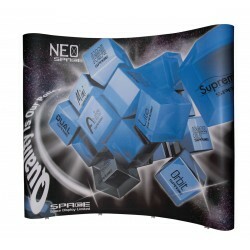 Some styles have the option of ordering fabric panels instead of graphics. These velcro-receptive panels allow graphics to be easily attached and removed, which is a popular option for those with smaller graphics. When ordered with custom graphics, there is an option of either premium or economy graphics. Premium graphics are printed on 12 mil opque polyester film with a 10 mil polycarbonate laminate and feature the greatest durability and image quality. Economy graphics are UV printed on a 15 mil opaque textured polyester film, offering very good image quality and durability without the need for lamination. 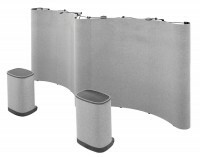 Some extra care must be taken with unlaminated graphics go keep them looking good, but this type of graphic has become the industry standard and it's a great option for short term use or for those who are able to handle the graphics more carefully when setting up and packing the display. 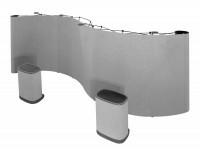 While the curved wall is by far the most popular style of pop up display, many shapes and sizes are available, from horsehoe shapes, to circular towers, so look through the products in this category, or filter the options by brand or size of booth space you have available, and if you need help in choosing a display or for advice, please contact us.